When I first joined the board of UKOUG there was a need to address content for members who are not within commuting distance of the home counties. Thier SIGs tend to be more generalist and so may not address all their needs, however we did find that the perpensity for these members to attend the annual conference is actually greater than normal. What we came up with were annual 1 day regional conferences, the first being the Irish Conference in Dublin in March 2003 which was an instant sucess and later that year we introduced the Scottish Conference. These events are more complicated to put together than a simple SIG, the attendance is much larger adn there are normally 4 streams and this week in the Raddison Glasgow was no exception. 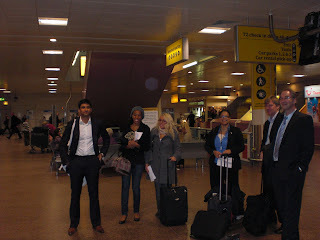 This picture shows the staff that travelled up along with Ronan our Chairman at the airport on our way home. It was another sucessful day and thanks to all those who spoke and to the committee that put toether the agenda. Steve Gold from Oracle Scotland gave a quick address at the start confirming his support to OUG in Scotland, and based on the day we will be around for a long time. What is attendance like at these regional conferences. With 4 streams could I guess ~100-125? They sound excellent.